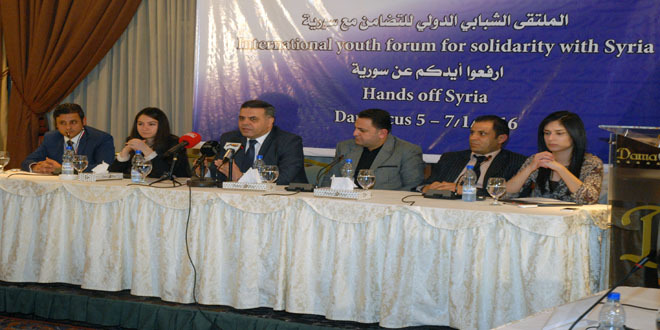 Damascus, SANA- Activities of the International Youth Forum for solidarity with Syria started Tuesday at Dama Rose Hotel in Damascus. The Forum is organized by the Revolutionary Youth Union (RYU) under the slogan “Hands Off Syria” with the participation of youth organizations from 20 Arab and foreign countries. 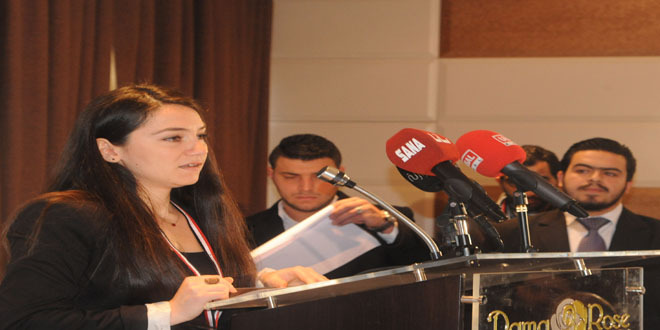 Elif Ilhamoglu, Secretary of the World Anti-Imperialist Youth Union (WAYU) showed solidarity and support to Syria in the face of the imperialist campaign hatched against it. She added, at the opening of the Forum, “We came here to express our solidarity with Syria”, expressing hope that the Forum will come out with recommendations unifying efforts through a program joining all youth organizations across the world for facing all attempts of partitioning, sedition and for defeating terrorism and extremism. 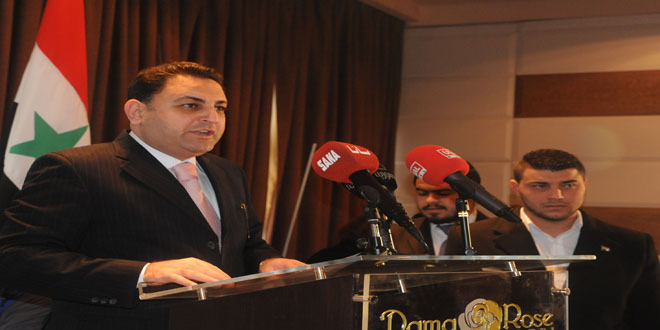 Abboud hailed the victories of the Syrian Arab army in the face of terrorism. 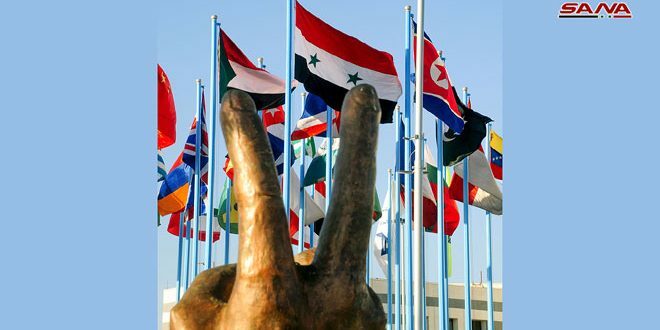 Youth organizations from 20 countries, including Lebanon, Iraq, Yemen, Palestine, Algeria, Egypt, Sudan, Democratic People’s Republic of Korea (DPRK), Turkey, Germany, Netherlands, Ireland, Libya, Jordan and Comoros Islands are taking part in the 2-day meeting. 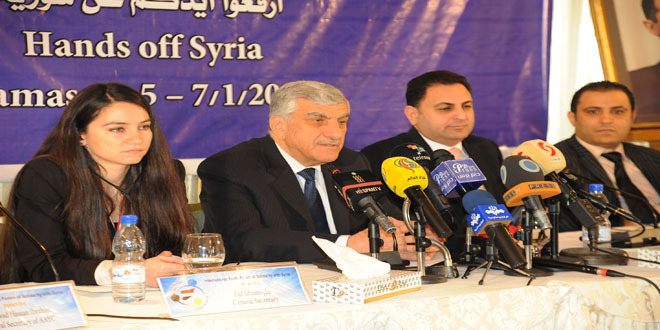 The forum aims at affirming solidarity of Arab and Foreign Youths with Syria in its war against terrorism, Abboud told SANA earlier. 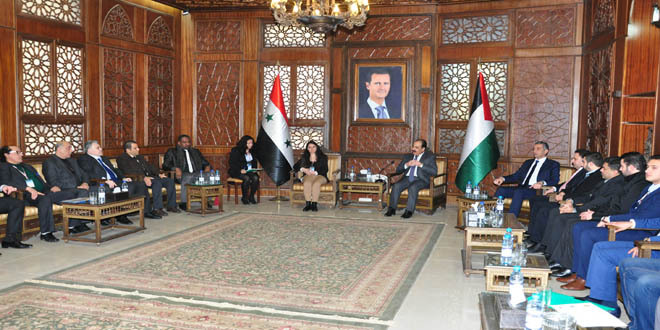 The activities of the Forum include visits to a number of significant sites in Damascus city. Later, Assistant Regional Secretary of al-Baath Arab Socialist Party (BASP) Hilal al-Hilal affirmed on Tuesday the important role of unions, organizations and student bodies in educating Arab youths to confront the Takfiri thought which is targeting them in the first place and using Islam as a tool to achieve its objectives. Meeting delegation members of the International Youth Forum for solidarity with Syria, al-Hilal expressed appreciation to the members’ support to Syria in in facing the universal war which waged against it since five years and aims at undermining its national sovereignty and its political stances. 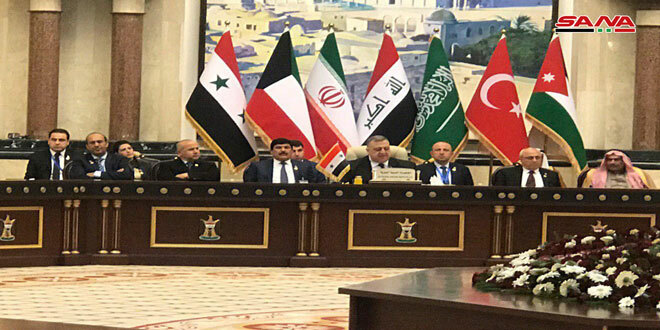 Al-Hilal pointed out that Syria’s steadfastness is due to its national unity, the great sacrifices of the Syrian Arab Army and the wisdom and tenacity of its leadership, adding that what was rejected by Syria during the last five years of the war will not be acceptable today. 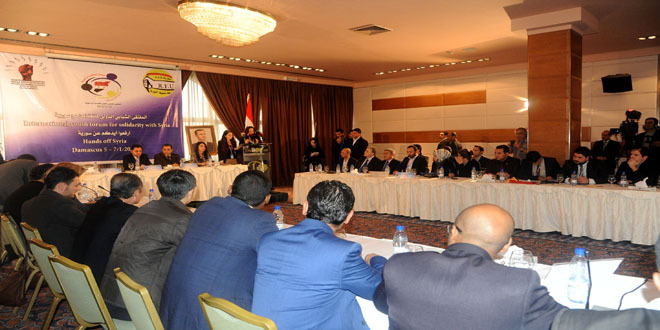 In turn, Delegations members of the forum said that their visit to Syria aims at expressing solidarity with it, hailing the sacrifices of Syrian Arab Army. Members of the Forum also met Assistant Foreign and Expatriates Minister Hamed Hasan at Dama Rose Hotel in Damascus, with Hasan saying that the Youth Forum represents true solidarity with the leadership, people, army, and government in Syria in the face of all forms of terrorism and interference in Syria’s internal affairs. 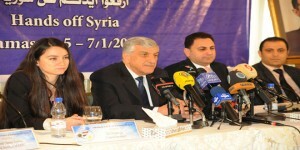 Hasan pointed out that Syria has repeatedly reaffirmed its commitment to international law and UN Security Council resolutions related to combating terrorism, as well as its rejection of interference in internal affairs and its adherence to respecting the choices of the Syrian people, noting that even while Syria is facing terrorist organizations, it is still exerting all possible efforts to find a political solution to the crisis. Hasan also stressed that Syria and Iraq are facing a common enemy which is terrorism, and that Syria is seeking to raise the level of coordination with Iraq since they are fighting the same battle and facing a mutual threat. For his part, Education Minister Hazwan al-Waz asserted during meeting delegations’ members the importance of the youths’ role through their solidarity and steadfastness to put an end to terrorism that hit the region. 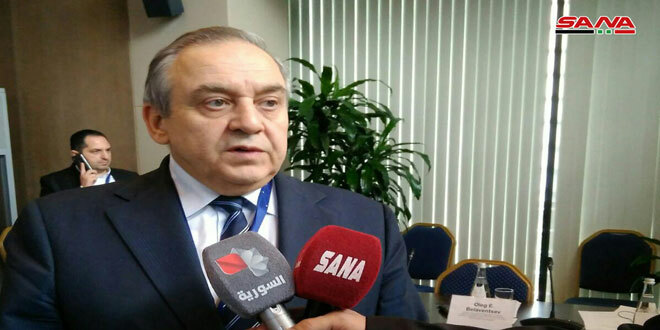 Al-Waz said the countries which supported terrorism since the beginning of the crisis in Syria have a problem in their educational curricula, calling for establishing “international neutral committees to evaluate those countries’ curricula”. Minister Al-Waz clarified that the ministry was keen to provide the best ways to make a success for the educational operation in light of the current circumstances in the country. 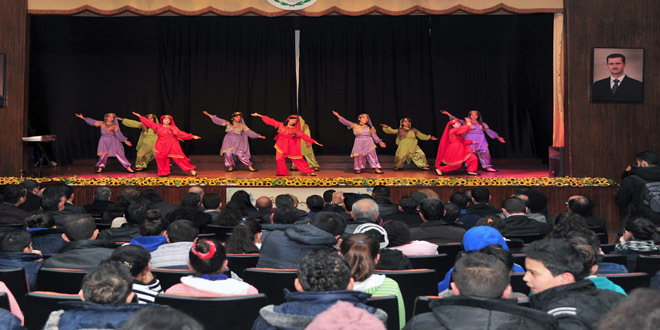 In a relevant context, the delegations paid visits to the Tomb of the Unknown Soldier and the Martyrs’ Daughters School in al-Mezzeh where its folk art troupe presented lyrical pieces titled “Sea of Alphabet” as its Choir performed activities from the Syrian heritage under the title “For Greening my Country”. 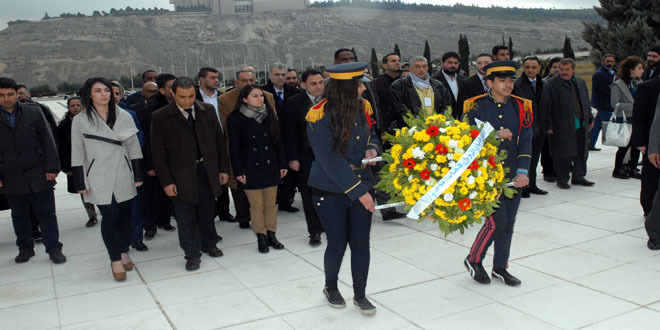 Director General of the Martyrs’ Sons and Daughters Schools Establishment Shahira Fallouh highlighted that the establishment of this school by the late president Hafez al-Assad is an evidence of honoring the martyrs who offered sacrifices to enable Syria achieve victories. On December 20th , the Pan-Arab Youth Forum was held at al-Baath University in Homs. Representatives of Arab Youth Organizations from 13 Arab countries in addition to Chad took part in the activates of the 3-day meeting.